Botanically, Christmas Cactus is, indeed, a true cactus; but for its own well-being, it really should have been given some other common name. To many people, the word “cactus” brings visions of extreme heat, sand, and dry air. Consequently these would-be gardeners give any and all cacti the growing conditions they assume (incorrectly, by the way) the plants might have been accustomed to. With Christmas cactus such treatment is fatal. The “Christmas Cactus” is originally a native of Brazil, where it grows upon trees as an epiphyte, in the manner of orchids. It doesn’t particularly care for heat, it would starve in sand, and dry air is an anathema to it. To enjoy the greatest success with Christmas cactus, just forget that it belongs to the cactus family. My own procedure is to plan the family vacation for early fall, since I seem unable to leave the plant alone if we are in the same house. The one thing Christmas cactus wants most of all, from mid-September until the first of November, is to rest. Between getting ready to go, and getting the house back in running order when I return, I’m too busy to do my usual heavy-handed watering, and the Christmas cactus really enjoys the partial neglect. Of course there is more to growing these plants than giving them an autumn rest. First of all, since they are normally epiphytes, they must be protected against water-logged soil. At the same time, they need ample water during their growing periods. Use a loose potting soil composed of peatmoss, perlite and with enough sand added to provide good drainage. When using solid-bottom planters instead of clay pots, I like to use a mixture of sand and peat or a violet mix which retains moisture well, adding in some perlite in for extra drainage, and allows some aeration of the roots. This mix, by the way, is excellent for many plants besides Christmas cactus… try it with African violets and watch them flourish! Don’t pot Christmas cactus too firmly; they tend to lop over when newly-potted, brace it in position until the roots have spread enough to hold it upright. 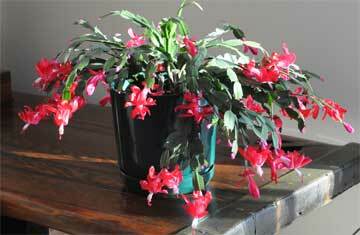 Watering and humidity play important roles in the growth of the Christmas cactus. Each grower soon develops a personal preference in how and when to water. As a general rule, the plants should be watered heavily when in active growth, and kept on the dry side during the fall. At no time should the plants be allowed to wilt from lack of moisture. Give them gentle showers once in a while, using tepid water. This not only stimulates new growth, but also keeps the plants dust-free and discourages insect infestation. Try to give them a humid location. I have two in the kitchen and where they don’t seem to suffer from dry air. If your home is excessively dry, set the pots on pebble-trays to increase humidity. 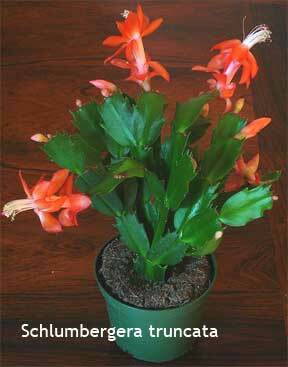 The temperature tolerances of Christmas cactus seem to range from below freezing to – way past stifling hot. I’ve seen them growing beautifully in greenhouses where the air was so warm I could hardly breathe. Yet ones on a friends kitchen-window ledge, where ice forms on the inside of the glass in very cold weather, go right ahead and bloom as if they enjoyed having cold feet. I believe the plants are able to adjust to their surroundings, provided they are given time to do so; plants constantly shifted from one place to another, or put outdoors for the summer, seem to lose some of this adaptability. Correct light intensity is also important to these jungle natives. Too much sun bleaches the foliage, and may burn new growth. Try to place them in an east or north exposure. If only south or west windows are available, give enough shade to diffuse the sunlight. Proper feeding is necessary, too. Some growers like to reduce both plant food and water for a brief period after flowering ceases. I prefer to give regular liquid fertilizer feedings throughout the entire growing period. This, like watering, soon becomes a matter of personal preference. You can readily determine the plant’s need for additional food by the color and texture of its joints; if they are a good green, and fill out properly, the plant is well-fed. 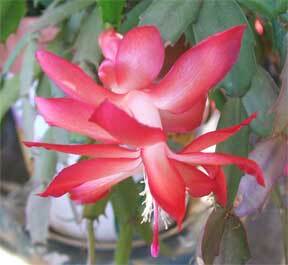 To propagate Christmas cactus, take cuttings of any length, from one joint to several inches. Insert one joint deep (single-joint cuttings should be inserted to half their length) in moist potting soil, and do not disturb for six months. Cuttings will also root in plain water, and may be grown on for some time before potting. Eventually, however, the older joints become rounded with age, and the plant begins to take on the appearance of a rather odd-looking tree; it should be potted long before reaching this stage. If this growing-in-water seems to contradict my earlier statement that the plants need to be kept on the dry side during fall, I can only agree that it certainly does! It is inconsistencies like this that make horticulture such a fascinating hobby! Far from being the difficult plant many people think it is, Christmas cactus is one of the easiest to grow and to bring into flower. If a plant refuses to set buds, the trouble probably lies with the care it received six months prior to the time bloom was expected. If it sets buds and then drops them, you’ve been careless with the water, giving too much or too little, or else you moved the plant and it’s too busy getting acclimated to go on with the business of blooming. Put it in a nice steamy east window, remember to give it food and water and a six weeks rest in the fall, and your plant will burst forth with its own Merry Christmas greeting next year.